On 30 January, Cardinal Vincent addressed the second international coordinating meeting of Talitha Kum, the international network of consecrated life against trafficking in human persons. The Cardinal expressed his 'admiration for the witness' which they give around the world by their 'forthright witness for justice and prophetic commitment to challenging the causes of trafficking and modern slavery'. Placing their work in the context of the Jubilee of Mercy, he said that their 'actions are themselves a supreme example of that quality'. He went on to say, 'Talitha Kum embodies a wonderful gift of the Church: a unity of love and effort which, at the same time, does not diminish or extinguish individuality and difference. Each of you remains true to your particular charism, the wellspring of your vitality, but through a commitment to shared action you show that cooperation enriches personal and congregational identities. 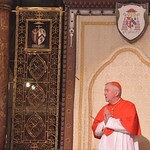 The Cardinal described the root of human trafficking as 'betrayal and the deliberate deception of vulnerable people'. This treachery, he said, led to the destruction of trust. He said that the ability to trust was necessary in rebuilding the lives of victims. He also spoke of trust as a vital ingredient in the relationships between bishops, police, religious and lay people in the fight against human trafficking and modern slavery. He went on to explain how the Santa Marta Group, which brings together bishops, police commissioners from around the world, government agencies and religious orders, has progressed since it first began two years ago. He described the cooperation among these groups to stop slavery, rescue victims and help them reclaim their lives, and prosecute the criminals who perpetrate these crimes. He explained in some detail the initiatives begun among various communities in England and Wales to raise awareness and provide outreach to vulnerable communities. He also described the work of Bakhita House in London which helps women rescued from slavery to recover and to rebuild trust in their lives. The members of Talitha Kum work in some 70 countries around the world. It was established in 2009, as a response to the desire for greater cooperation and strengthening the work of combating human trafficking in five continents.